If you've ever unpacked your child's lunch box at the end of the school day only to find that most of the lunch you packed was hardly touched, you know how exasperating it can be. And if this happens regularly, it can be worrying, too. Sandwich cutters in fun designs are a parent's best friend. That turkey and avocado sandwich is more likely to be scarfed down if the sandwich is cut into a dinosaur or stars. Big portions can be intimidating for little stomachs and little fingers. Your child isn't likely to eat 10 baby carrots—the reality is that most kids who like baby carrots will probably consume 5 or 6, depending on how many they will eat in a sitting. If you put in a whole apple, make it a small-sized one that'll be easier for small hands and mouths to eat, or better yet, cut up the apple into slices to make it easier for your child. Peel oranges and put them into reusable bags or cut up a banana and mix it with blueberries and other fruits to make a healthy fruit salad. It may be tempting to stuff your child's lunch box with a big sandwich, a full-size yogurt, and a big cup of fruit. But young elementary-school kids are often too busy chatting with pals to eat a huge lunch, and many don't eat huge meals in one sitting. Think about how your child eats at home; if he tends to graze and eat snacks and small meals, don't expect him to eat a giant lunch at school. There are some great bento boxes on the market today, or you can make your own compartments with reusable silicone cupcake liners. Cut vegetables like carrots and zucchini into fun shapes using Japanese vegetable cutters, which are inexpensive and fun. Turn watermelons and cantaloupes into bite-sized flowers and stars. Not only will the fun shapes make the fruit and veggies more attractive, the small size will make it less daunting and easier for kids to eat. Whether it's bow tie pasta with broccoli bites, macaroni or a healthy quesadilla with beans and veggies like zucchini or spinach hidden inside, cheese is the magic ingredient that will make your dish something kids will want to gobble up. A school lunch box isn't the time to trot out a new recipe or food that your child isn't familiar with. Most young children like to stick to their favorites. While dinner is a great opportunity to encourage kids to try something new, a better bet for school lunches is to stick with old favorites. Jazz up water with some cut up fruit or give him grapes to go with some cheddar cheese and multigrain bread. Make other sweet goodies such as a cookie or brownie a once-in-a-while treat but do use fruit to add a sweet touch to your child's lunch. If you had spaghetti and meatballs a night or two before, it can be a great addition to a school lunch. Add some melted string cheese, broccoli bites and other favorite veggies, and voila! A nutritious lunch that your child is likely to eat. Not only will this be a great opportunity to teach your child responsibility and independence, but it will help motivate your child to eat the lunch he helped pack. Pasta salad with olives and feta? Cucumbers with cherry tomatoes and a ranch dipping sauce? What about a turkey and avocado rolled in a flax seed wrap? Weekend lunches are the perfect time to try out different school lunch ideas to see what your child likes and doesn't like. Finally, be patient. 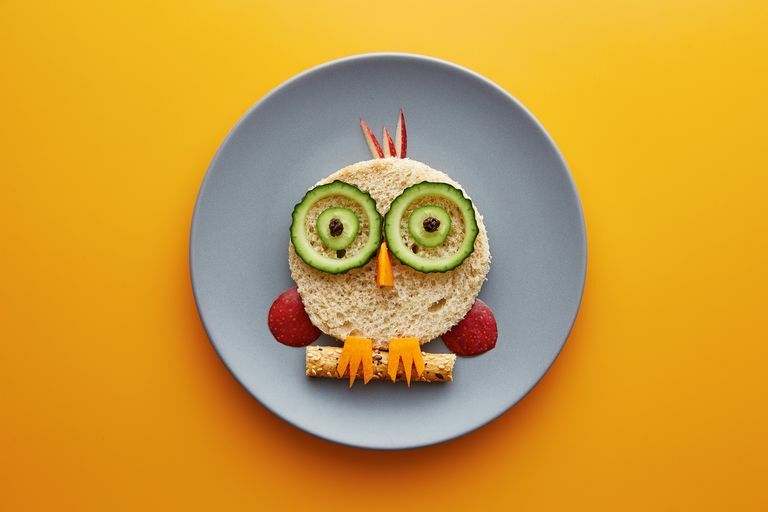 Pack a note inside your child's lunch reminding her how much you love her, and ask her to try her best to eat up her healthy lunch so that she can be big and strong and power her brain to learn and have fun in school.